Home to the country’s largest end of year party, Zurich is a fabulous city by the water buzzing with daily activity and a lively nightlife. Bring in the New Year in style this December and join us as we eat, drink and be merry in Switzerland! 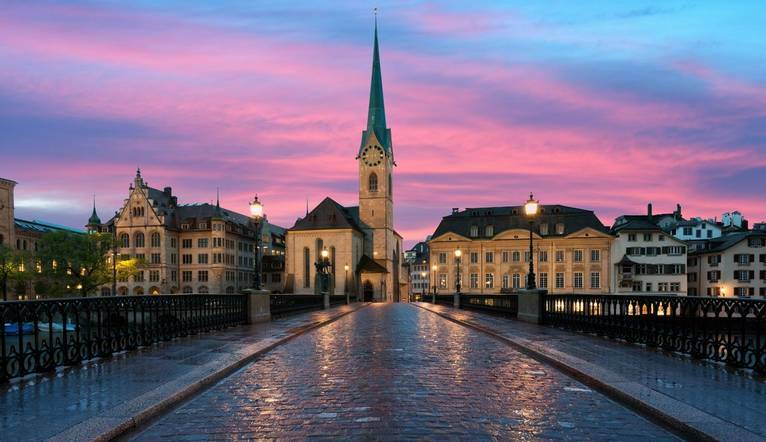 Even though the city is a global centre for banking, Zurich still has a picturesque Old Town (Altstadt) full of history which contrasts well with waterfront promenades along the Limmat River. Our guided walking tour introduces Switzerland's economic centre and the streets on both sides of the river Limmat. The churches amaze with stained glass windows by famous artists: Marc Chagall at the Fraumünster and Sigmar Polke at the Grossmünster (entrance fees not included). After the tour we may like to explore on our own, or why not take a cruise on Lake Zürich in the afternoon? The following day we take a trip up to the Rhine Falls, one of Europe’s largest waterfalls, and then on to Stein am Rhein, a small town known for its well-preserved medieval half-timbered houses with beautifully painted facades. Step back into the 15th century as we explore the heart of the old town around the town hall square. Afterwards we will then back to the city for a New Year gala in one of Zurich’s lovely local restaurants. With a free day before heading home, you could make the most of New Year’s Day and purchase a Zurich Card which gives you unlimited 2nd class travel by tram, bus, train, boat and cable car throughout the city for 24 hours (night supplement applies). There is also free or reduced admission to many museums, discount in various local stores and cultural activities. There is a bar and restaurant serving local produce or Mediterranean and Swiss specialities. Our single rooms offer a host of features including air-conditioning, shower, mini-bar, tea/coffee-making facilities, safe, satellite TV, radio, hairdryer and free Wi-Fi. The transfer time from Zurich Airport to the hotel is approximately 15 minutes depending on traffic. During your holiday, we have included a guided tour of the the city and a tour of the Rhine Falls with a visit to the village of Stein am Rhein.